Joseph Martos is a retired professor of philosophy and theology who lives in Louisville, Kentucky. Born and raised in New York City, he attended Catholic grade school and high school before entering a seminary to study for the priesthood. Sent in 1964 to the North American College in Rome by the Diocese of Brooklyn, he attended the Gregorian University at a time when the Second Vatican Council was in session, giving him a solid grounding in both traditional and contemporary theology. He returned to the United States without being ordained and continued his studies at Boston College, where he concentrated on the ideas of the Canadian Jesuit, Bernard Lonergan. Receiving a scholarship to DePaul University in Chicago, he completed his doctoral studies in classical and contemporary philosophy before writing his dissertation on Lonergan's proof for the existence of God. The mid-seventies were lean years for college teachers but a boom time for religious educators, so Dr. Martos worked as a parish religious education director and high school religion teacher before receiving his first academic appointment at Briar Cliff University in Sioux City, Iowa. 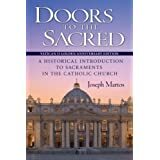 Asked to teach a course on the sacraments, he could not find a good textbook to use, so he wrote Doors to the Sacred: A Historical Introduction to Sacraments in the Catholic Church. First published in 1981, the book has been used in universities and seminaries for three decades. It is updated periodically to take account of continuing developments in sacramental theology and practice. After leaving Briar Cliff, he taught briefly at Xavier University in Cincinnati before moving in 1985 to DeSales University in Allentown, Pennsylvania, to chair the school's theology department. Invited in 1992 to Spalding University in Louisville, he was director of the Russell Institute of Religion and Ministry until the university discontinued all of its humanities programs in 2003. Since then he has continued to teach graduate theology courses during the summer while spending much of his time in research and writing, as well as in business pursuits. An invitation from Liturgical Press to publish The Sacraments: An Interdisciplinary and Interactive Study gave Dr. Martos an opportunity to revise and expand an earlier book which, as the first volume of a set, had not received much individual attention. It also gave him a chance to make some of his other works available on the internet to students, teachers and general readers. For a one-page résumé of the author, click here. For a full curriculum vitae, send a request to TheSacraments@Gmail.com. To order a copy of The Sacraments: An Interdisciplinary and Interactive Study, click here or go to a bookseller of your choice. in the Catholic Church, click here or go to a bookseller of your choice.